General Information:One Dozen Callaway Chrome Soft Golf Balls Your photo/logo in..
General Information:One Dozen Callaway ERC Soft Golf Balls - Personalized Your photo/..
General Information:15 Callaway Super Hot 70 Logo Golf Balls Your photo/logo&nbs..
General Information:Callaway Supersoft Magna Golf Balls - Dozen Your photo/logo ..
General Information:One Dozen Yellow Callaway Chrome Soft Golf Balls Your photo/logo&..
General Information:One Dozen Callaway Chrome Soft X Logo Golf Balls Your photo/logo&..
General Information:One Dozen Callaway Warbird 2.0 Logo Golf Balls Your photo/logo&nb..
General Information:One Dozen Yellow Callaway ERC Soft Golf Balls - Personalized Your..
General Information:Yellow Callaway Supersoft Magna Golf Balls - Dozen Your photo/log..
General Information:Yellow One Dozen Callaway Chrome Soft X Logo Golf Balls Your phot.. Creating your own customized golf balls doesn’t get easier than with Custom Made Golf Events. With a simple process and the option to upgrade to pro-grade balls, adding your logo and personal touch is a breeze. Within our options, you can choose to add a logo to Titleist, TaylorMade and Callaway logo golf balls, among other top brands. 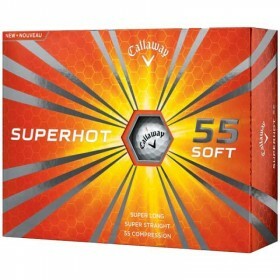 However, our Callaway custom balls are quite popular, and we have multiple options for such. Callaway balls represent one of the top golf brands represented by Phil Mickelson that provide tour-proven distance and a soft feel to help you shoot better scores on the course (you may not shoot like the pros on the PGA tour, but itll certainly help!). With fast ball speeds & low spin off the driver of any quality golf club, these are a great option. You will have the standard Callaway logo on one side with your corporate logo or text on the other. This is perfect for any outing, tournament or charity event. When you choose to work with CMGE in creating custom golf balls, you’ll have the option to choose from three types of Callaway balls: Chrome Soft, Super Hot 70, and Waybird 2.0. Each option comes in a set, and you can order as many sets (boxes) as you’d like. Of course, the best part is adding your own logo. Whether you choose a full-color logo or three lines of text, the choice is yours. Either way, you’ll end up with your own, unique golf balls—which are great for personal use, gifts, business promotions, and more. In addition to making your purchase which comes in the standard boxes which are packed 4 sleeves of three, one dozen total, we also offer our custom tubes which include your items nicely packaged to give out individually. This is a great option to put in a bag as a giveaway to each goler playing. In designing your custom logo golf balls, simply choose which Callaway balls you’d like to get started. From here, all you have to do it upload your logo and add any special instructions (if applicable). We’ll then provide you with virtual proof of your golf balls within 24 hours! Once you’ve approved the look and design, we’ll start printing and have your items out to you in no time. Keep in mind, you can personalize much more than golf balls here at CMGE. Choose from golf tees, golf tee and marker combos , matchbook packets, and much more. No matter what you choose to customize, do it with Custom Made Golf Events!